I've been wanting to share more of the books I'm reading (not just the ones provided by publishers for review), but really, it is summer, and I am struggling to find time to blog! 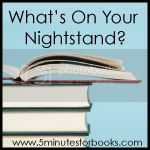 What's on My Nightstand link-up is a great way for me to discuss some of these books that I am enjoying (or not). Little Men is a book that is for fans of Little Women, but fully focused on the boys that Jo and her professor educate and love at Plumfield, a (boarding) school for boys. It's full of funny and adventurous stories boys and girls alike would love. I enjoyed it and will continue to read more of Louisa May Alcott's writing. The Peach Keeper was an audio book that I grabbed from the library shelf without any prior knowledge of the author or the book. It was a good book. Its theme seemed to be being true to yourself instead of what others expect you to be. The story follows several people who went to high school together. Though they weren't friends then, circumstances change and they find themselves getting to know one another more than ten years later. (The book had minimal language, but there were two-I think-somewhat mild scenes that would make this a PG-13 book.) I will be looking for other Sarah Addison Allen books. A very good book was William Henry Is a Fine Name, written by a local-to-me author Cathy Gohlke. It's set prior to the Civil War, and I have to say, may be the finest book I've read depicting the gruesomeness of slavery while also demonstrating the need for it. It made me really wonder which side of the fence I would have sat upon had I grown up on a plantation in the South. Robert was white, and his best friend black, they shared everything...except the knowledge of the Underground Railroad. I thoroughly enjoyed it! (While reading this my daughter picked up the book, saw that it was written by Cathy Gohlke, and proceeded to read the first few sentences, remembering having met her before.) I must say it was rather neat to read about the UGRR located so near where we live and the actual town where Derek and I lived in Maryland when we first married. Choosing Gratitude by Nancy Leigh DeMoss. I've read a couple great reviews and can't wait to review it myself! And hopefully a couple more titles from my shelf and for review! If you liked Little Men you must follow up with Jo's Boys. Vist my blog for a review. I am reading The Complete Chronicles of Narnia (currently on Prince Caspian). I'll Watch the Moon sound very good! May have to see if the library has that one! I always love revisiting Alcott's books. I'm still trying to decide whether to jump in for that challenge. 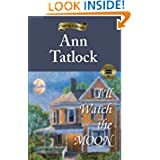 I read I'll Watch the Moon, and I remember liking it except there was one thing that bothered me, but I can't remember what it was. That was before I was blogging, I guess! LOL! So glad you are including your kids on the Narnia Challenge! I checked out "The Peach Keeper" from my library last month and ended up taking it back without even opening it(which is sad). I'll definitely have to put "I'll Watch the Moon" on my list! I'm adding I'll Watch the Moon to my list, as well as William Henry is a Fine Name. Both sound great! Little Women is one of my favorites but I've somehow never read any of the other books about Jo! I need to remedy that soon. I love Sarah Addison Allen, and The Peach Keeper is one of my least favorite of hers. Check out Garden Spells or The Sugar Queen. I've had "Peach Keeper" on my list for ages--I've listened to all her other books and enjoyed them for something light. "Little Men" is fun! I really want to read William Henry Is a Fine Name. Thanks for the recommendation of it! Re: Begun. I completely agree. Why are some words just weird? I loved the Ann Tatlock novel A Room of My Own when I read it years ago after I'd been given it as a gift. But I've never read anything else by her. I'll be adding I'll Watch the Moon to my TBR. I have not read any of your books, but you sure made me want to read a few of them! William Henry is a fine Name is a book that's on my library list to be read at some point in time. I may have to bump it up.